Lewis Hamilton has secured pole position for the Japanese Grand Prix in a tricky qualifying session that was made complicated by rain. 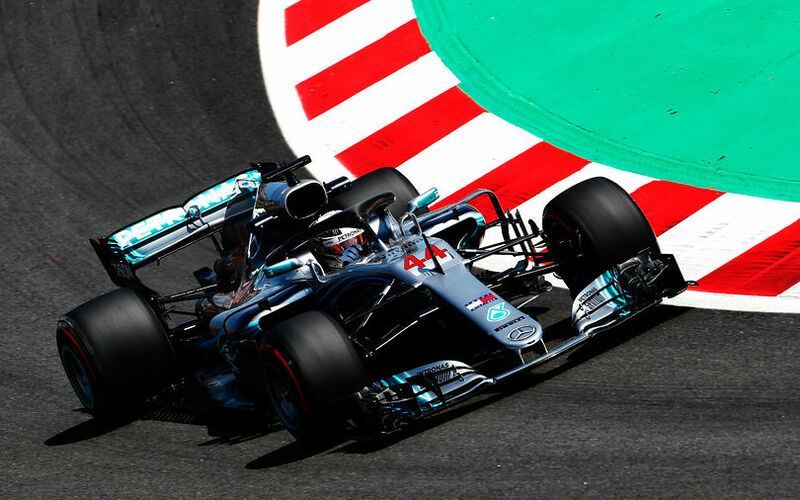 Valtteri Bottas was second fastest, ahead of Max Verstappen. Championship contenders Ferrari and Vettel made mistakes at crucial moments, leaving him 9th on the grid. Qualifying kicked off on a slightly damp track. There were no obvious wet patches, but the circuit remained slippery after earlier showers. That became all the more clear about halfway through Q1 when Vettel spun in the hairpin while at the same time, Marcus Ericsson simple went wide at spoon, and subsequently veered off the track, through the gravel and into the barriers, breaking the front right suspension of his Alfa Romeo Sauber. This immediately triggered a session stoppage, enabling the marshalls to clear the car safely. 10 minutes were left on the clock when the session was restarted. Vandoorne and both Renault immediately went out again for a clean lap, ahead of returning to the pits to prepare for another flying lap in the dying minutes, like most of the cars in risk of elimination. That includes both Renaults, both McLarens and the Williams cars. The outcome confirmed yet again that McLaren continued to struggle, as they were eliminated and slowest. Sirtokin and Hulkenberg joined them in having a short qualifying. In Q2, Mercedes immediately went out on track on the soft tyres. Raikkonen emerged behind them on the super softs, and didn't want to waste time, passing Hamilton to be able to be able to start his flying lap ahead of everyone. Still, both Mercedes were faster, and in fact fastest of all with just a single lap on softs. Vettel and Raikkonen ended at 0.3s and 0.6s while Verstappen was 5th fastest, despite complaining about a loss of power. Ricciardo was even worse off, coming back to the pits after an incomplete warm-up lap. He was pushed back to the pitbox after losing all drive. Minutes later, some raindrops were spotted around the track, complicating things for the drivers who tried to improve on their earlier times. Magnussen was the first to try so 3 minutes from the end, but ended up a second off his earlier lap. Leclerc meanwhile spun between both Degners, despite taking it very easy. The events out on track made Ricciardo realise there was no real chance to improve. He seemed ready to go out after his mechanics has done some repairs, but with 2 minutes left on the clock, Ricciardo stepped out of his car, massively disappointed after another difficult qualifying session. That meant Bottas, Hamilton and Grosjean went through to Q3 on soft tyres, with the others on super soft. Because of the weather, all were eager to go out quickly. Raikkonen and Vettel were first to queue up at the end of the pitlane, opting to use intermediates. While still there, Vettel reported "I think it looks too dry". And indeed, half a lap later, Vettel said he'd come back in for slicks. And so did Raikkonen. All others opted for super softs, and by the time both Ferraris were out again, Hamilton was kicking off his first flying lap of the session. Hamilton went on to go fastest on that lap, 3 tenths up on his team mate, and 1.3s ahead of Verstappen who ended up third fastest. Raikkonen was 4th fastest with his first attempt, faster than Grosjean. Vettel on the other hand made a mistake on his own first attempt and was 4.5s off the pace with just the 9th fastest time. Tension was building for sure, as more rain was predicted, and all were rushing to start their final flying laps. And indeed, when Hamilton started his second attempt, rain drops were falling again. Bottas, 15s later, almost lost it through Turn 2, just like Raikkonen moments later as well. The rain has simply become too much by the time Vettel ended up at Turn 1, forcing him to drive back to the pits slowly, and settle for 9th on the grid.